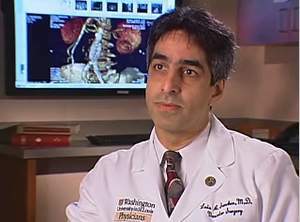 Dr. Luis A. Sanchez, Vascular Surgeon at Barnes-Jewish Hospital, Dr. Juan C. Parodi, Professor of Surgery at Washington University School of Medicine and Barnes-Jewish Hospital and Dr. Samuel R. Money, Program Director and Professor of Vascular Surgery at Ochsner Clinic in New Orleans, LA, will be your hosts for the one-hour webcast. Like all the Zenith AAA Endovascular Graft main body components, the Renu AAA Ancillary Graft utilizes an uncovered suprarenal stent with anchoring barbs to provide strong proximal fixation and enhanced graft-to-vessel sealing. Its lightweight, strong, shrink-resistant woven synthetic polyester graft material is the same that has been used in all Zenith endografts from Cook. The new Renu graft system uses Cook's proven Flexor® Introducer System that features a kink-resistant, hydrophilic delivery sheath. A trigger-wire system facilitates accurate placement, controlled release and stabilization of the ancillary endograft during deployment, while the system's Captor® Hemostatic Valve inhibits blood reflux. The world's largest privately held manufacturer of medical devices with international headquarters in Bloomington, Ind., COOK® (www.cookmedical.com) is a leading designer, manufacturer and global distributor of minimally invasive medical device technology for diagnostic and therapeutic procedures. Since its founding in 1963, Cook has created innovative technologies for drug-eluting and bare metal stents, aortic and vascular endografts, catheters, wire guides, introducer needles and sheaths, embolization coils, medical biomaterials, vena cava filters and other minimally invasive medical devices for radiology, cardiology, urology and OB/GYN, critical care medicine, surgery, gastroenterology, bone access and endovascular therapies.